The Marines are apologizing for a well-intentioned Christmas gift gone wrong that has upset the families of about 1,150 fallen Marines and sailors who received a Purple Heart Christmas tree ornament in the mail addressed to their deceased loved one. Late last week the Marine's Wounded Warrior Regiment mailed about 9,000 Christmas ornaments donated by the Semper Fi Fund, a charitable organization. The ornaments were intended for post 9/11 living Marine recipients of the Purple Heart, which is the award given to service members wounded in combat. 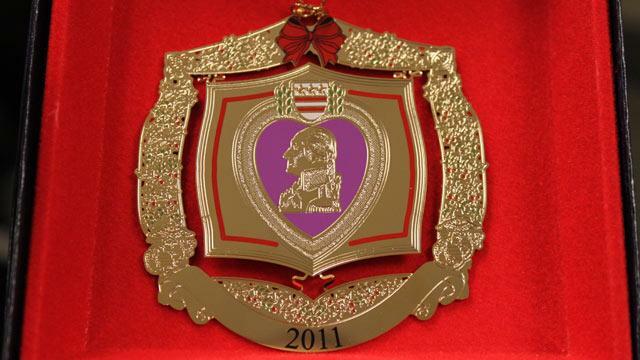 Sailors awarded the Purple Heart while attached to or serving in support of Marine Corps units were to also receive the brass ornaments that contain an image of the Purple Heart in the center. However, the regiment's list of Purple Heart recipients did not distinguish between the names of living and deceased recipients of the medal. That meant about 1,150 families of fallen Marines and sailors also received the ornament in packages addressed to their deceased loved one. The regiment apologized to the families today after it began to receive calls Monday night from family members distressed about how the packages had been addressed. "There are no words to express how very sorry we are for the hurt such a mistake has caused the families of our fallen warriors," Col. John L. Mayer, the regiment's commanding officer, said in a statement. "We always strive to honor the sacrifices these Marines, sailors and their families gave to this country. "There is no excuse for why this happened," he said. "We accept full responsibility for this error and are moving quickly to reach out to the families we have affected." "The intention was to thank Purple Heart recipients for their service," said Capt. Jill Wolf, a spokeswoman for the Wounded Warrior Regiment, which assists non-medical care to injured Marines, sailors and their families as they return to duty or transition to civilian life. The regiment is sending letters of apology to the families of fallen Marines and sailors included in the mailing and Mayer is personally calling the families who contacted the regiment. Wolf said that the Marine Corps began to receive calls from the families of fallen Marines on Monday as the packages began to arrive in the mail. By this evening, 35 families had contacted the Marines, with the majority expressing shock that the packages had been addressed to their loved ones and asking to be removed from the list. She said there had also been some positive feedback from some families who wanted the Marines to know how much the ornament had meant to them, but who also asked to be removed from the list.